How Not To Check Your Chicken Gender - 3 Worst Methods!!! April 20, 2016 April 28, 2016 - by Gold Cochin - 3 Comments. 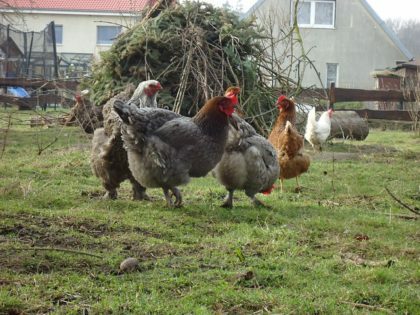 We at the typesofchicken.com team strive to give our readers useful and correct information concerning everything about the life of a chicken keeper. We focus on the Pros & Cons about a certain chicken breed, how to manuals about stuff in and out of your coop and more. We also give our best to spend some time on the many ways that you can have fun with your chickens. Some time ago we gave you an article about how to check your chicken gender, and now it is time for us to share with you how NOT to check your chicken gender and 3 worst methods of doing it. The shape of the egg that the chick comes from will not tell you which gender your chick will grow in to. Many arguments support that this method is useless but the argument we like to use that the shape of the egg is defined by the breed and not the gender. However, some people have said that this method worked 75% of the time for them, but not for all breeds. So maybe there are some breeds that can prove that this method works, but since it doesn’t work for all breeds we recommend that you try another way to check you chick`s gender. We can`t make the sense why would a method like this work – when you hold the chick upside down if it struggles it is a cockerel, if it doesn`t struggle it is a pullet. This is a completely false method to check your chick`s gender and we highly recommend that you DO NOT use it! In worst cases you may injure or even kill the chick so as we said – DO NOT use it! 3. The DUMBEST METHOD EVER !! Have you ever seen a chicken keeper check the gender of the chick by holding it by the neck using two fingers? If the answer is yes – why didn’t you slap him? If the answer is no – well when you do – SLAP HIM! Truly this is the dumbest idea ever to check the gender of your chick – it is said that when you lift up a chick by the neck, if it struggles with its legs then it is a male, if it doesn’t struggle but just lifts the legs up then it is a female. Completely inaccurate, and as we said about the “holding the chick upside down” method this method can also lead to your chick`s death so – DO NOT use it! If you have used any of these methods before we at the typesofchicken.com team would recommend that you use different methods that are more accurate. What we would also want to recommend is if you want to be completely sure about the gender of your chick that you consult with your local vet or hatchery. The methods that you can use around your coop are mostly not completely accurate even the ones that we recommend. Next Article Inside The Mind Of A Chicken! Anyone that would DO that stood stuff needs to be flogged, that’s just plain stupid & mean. The egg method actually works without fail. If it lays an egg, it’s safe to say it’s NOT a rooster. Just thought I’d pass this great insight on down the line, for what it’s worth. Just joking, I want y’all to know how much I enjoy the information I always get reading your materials. The first time I ever got chicks I wanted only pullets and some guy did the two finger method. I thought he was crazy but didn’t know any better. Both chicks turned out to b roosters.